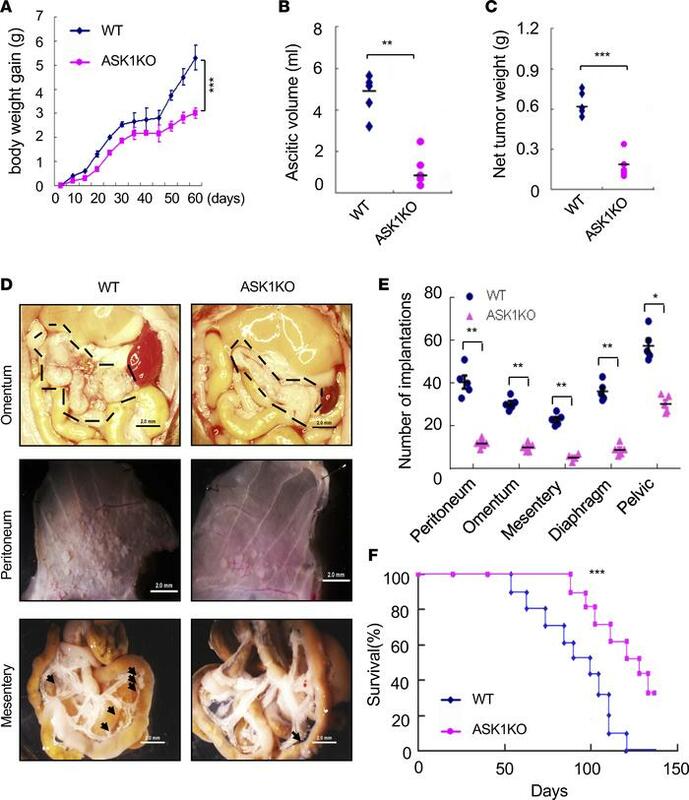 Attenuated ovarian cancer growth and peritoneal implantation in ASK1-KO mice. An orthotopic mouse ovarian cancer model was established by injecting 1 × 106 mouse ID8 cells i.p. to C57BL/6 (WT) and ASK1-KO female recipient mice. (A) Mouse body weights were measured at indicated time points (day 0–60), and body weight gains are shown. (B and C) Ascitic fluid volumes and net tumor weights were measured at day 60. Data in A–C are presented as means ± SEM, n = 10. **P < 0.01; ***P < 0.001 (two-sided student’s t test). (D) Representative images of tumor implantations in omentum, peritoneum, and mesentery at day 60. Scale bars: 2 mm. Tumor implantations are indicated by outlines and arrows. (E) Statistical analyses of tumor implantations in omentum, peritoneum, mesentery, diaphragm, and pelvic cavity. n = 5. Data are presented as means ± SEM. *P < 0.05; **P < 0.01 (two-sided student’s t test). (F) Mouse modality was monitored, and survival rates were quantified; n = 24 mice per group. Kaplan-Meier analyses using the log-rank test was performed; ***P < 0.001.